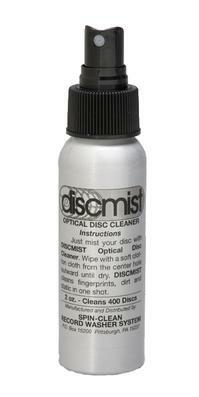 Introducing Discmist, an optical disc cleaner from the makers of Spin Clean. Most music lovers and audiophiles clean their vinyl records routinely but amazingly do nothing for their CD collection. However, cleaning CDs is just as important as cleaning records, especially that first cleaning of brand-new product right out of the package. Like vinyl, CDs have a residue left behind on the playing surface that is a byproduct of the manufacturing process and should be removed by cleaning prior to playing. Likewise, blank CDs should be cleaned before being "burned". This will result in a better copy. Use this cleaner on all types of optical discs. See what you've been missing on DVD too! As with Spin Clean's vinyl-cleaning fluid, the Discmist formulation contains no alcohol.